Drones! What are they good for? Fox News' Charles Krauthammer & Black Ops II? One UAV down. One to go. Drones! What are they good for? According to Charles Krauthammer, a Fox News contributor, drones are good for hunting bad guys overseas, but should not be flying overhead in U.S. skies. At least, that's what he thought last year in a segment he participated in on Fox News. 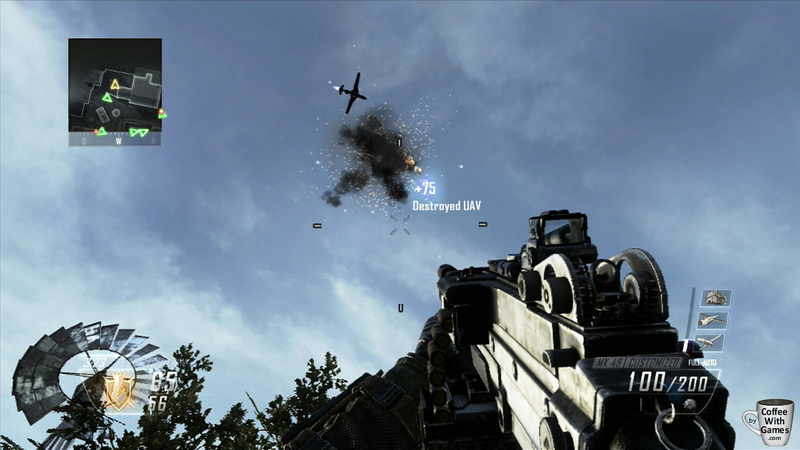 If you play Call of Duty: Black Ops II, you might find other reasons drones are good. What do I find drones, or UAVs as they are called in Black Ops II, good for and do I agree with Mr. Krauthammer's initial statement last year on the issue of drones flying in the U.S.? Brew yourself some coffee, take a look, and watch a video I edited together on the topic! Call of Duty: Black Ops 2 Weapons Double XP Weekend! The title says it all really, and the image above tells the whole message. 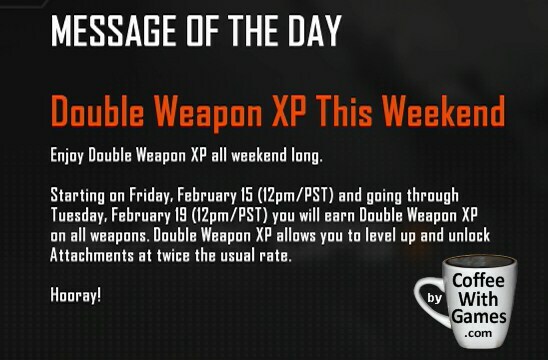 If you have been wanting to level up some weapons in Call of Duty: Black Ops 2, this weekend is the perfect time to make that happen. I think it's about time I give some weapons a try, and see how I like them (or, don't!). I have been playing the game an unhealthy amount at night; late into the nights. Speaking of which, I'm going to finish drinking some coffee now, and hop back online here in a few minutes. If any of you have a Wii U and Black Ops 2 for the system, feel free to add my Nintendo Network ID, Coffees, to your friend list. January. Another month, but the one that starts off a new year. With January rolling around, I decided to take the month slower, and do some planning. I like the idea of, "If you fail to plan, you plan to fail." a lot, but more on that later. With January now history, what coffees did I consume and games did I play during the month? Can you guess (without looking!) what my most played game was during the month? Brew yourself a nice cup (or two) of coffee, and let's take a look! The Folgers Black Silk coffee started us off for the New Year, but didn't last us very long since it was a smaller container of coffee that we used most of when we went out of town in December. The Folgers Black Silk is a "Dark" roast coffee from Folgers, and if you enjoy bolder coffees, you would probably enjoy it. After the Folgers Black Silk ran out, we went to our typical 200+ coffee cup container, that being the Maxwell House Daily Brew. It's more of a medium roast coffee, on the lighter side, but not as light as the Starbucks Blonde Veranda Blend we have brewed in the past. After we ran out of the Maxwell House Daily Brew, I opened up one of Mrs. Coffee's Christmas gifts to me, the Café Bustelo Coffee Espresso. It was finely ground, to a powder, dark roast coffee. I believe it was originally aimed at the Hispanic market, after researching it a bit, but in recent years has started trying to grow its brand. I'm not sure if Mrs. Coffee knew about the coffee before buying it, or if she saw it at the store browsing and decided to get it for me on a whim. The coffee is definitely a stronger blend, and we enjoyed it while it lasted. The last coffee we brewed in the month was Maxwell House French Roast. We have brewed this multiple times over the last few years, as it is one of the regular Maxwell House coffees purchased by Mrs. Coffee. While the description for it is "Medium Dark", I still tend to feel this is more of a "Medium" roast. Being a "Medium" roast is not a bad thing, and we really enjoy the coffee, but it's just that if you like the typical French Roast "Dark" roasted flavor, this isn't as strong as you would probably expect. 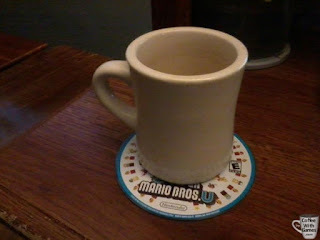 Here's the "Instant Coffee" list for the games I played in January: Trine 2: Director's Cut, Call of Duty: Black Ops 2, New Super Mario Bros. U, Mutant Mudds, Sonic and All-Stars Racing Transformed, Nintendo Land, Super Mario Bros., Super Mario Bros. 3, Super Mario World, The Legend of Zelda: A Link to the Past, Mario Kart Wii, Assassin's Creed III, Rabbids LAND, Rayman Legend Demo, ZombiU Demo, and World of Goo. Mushrooms, a staple for platforming success since the 80s? 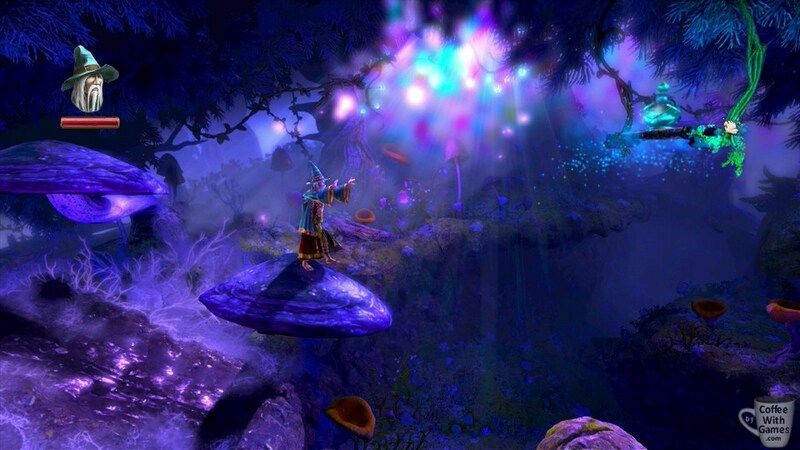 Trine 2: Director's Cut - Last month I reported I had finished the main campaign, and since then I have been going back through the game attempting to find all the hidden pieces in the levels, and also attempting to unlock the Wii U's exclusive level (I think). With more than 40 hours in the game, I still haven't found everything just yet, but am hoping that I can finish it all up this month. If you have a Wii U and Trine 2, please add my Nintendo Network ID to your friend list, Coffees, and hopefully we can play a few levels online sometime. Call of Duty: Black Ops 2 - Multiplayer. Multiplayer. Multiplayer. I put many hours into Black Ops 2's multiplayer in January, mainly Team Deathmatch battles. As I commented on the "Black Ops 2 Wii U patch available." story, I have not had any issue finding a match to join when I hop on playing Team Deathmatch battles. If you enjoy the basic Team Deathmatch battles in FPS games, and particularly the Call of Duty games, I can easily recommend you adding Black Ops 2 Wii U to your collection. I still greatly enjoy using the GamePad to play off just of it, while using our original Wii to "watch" a show on Netflix. My Call of Duty: Black Ops 2 combat record, as of January 30th. New Super Mario Bros. U - I beat the single-player campaign in January, after only about 12 hours of play. Now, I didn't finish the campaign with all the hidden Star coins, but right now there are a few things about New Super Mario Bros. U that I like, and a few things that I don't like. I'll give you one of each for now. 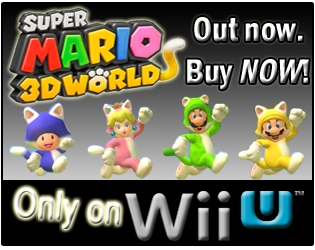 I like that the game-play is solid as ever for a Mario platformer, and that is a positive. I don't like that the GamePad cannot be used in multiplayer, except in Boost Mode. That screams of programming laziness and nickel and diming of consumers to me. I can only imagine Christmas morning in some houses, opening up the Wii U and New Super Mario Bros. U with one Wii Remote, only to find out you actually need two Wii Remotes to play multiplayer. It basically makes New Super Mario Bros. U a $140 game to play local multiplayer, because you can't use the GamePad for it (see: the controller that came with the console). We have multiple Wii Remotes, but the fact that one of us couldn't use the GamePad for multiplayer and we had to unsync one from the Wii to the Wii U was a bit odd, and makes me wonder why they didn't just program the Boost Mode to be activated with a button press from the menu, still allowing the GamePad to be used for regular game-play. Another version of "CoffeeWithGames", and why physical is better than digital...sort of. 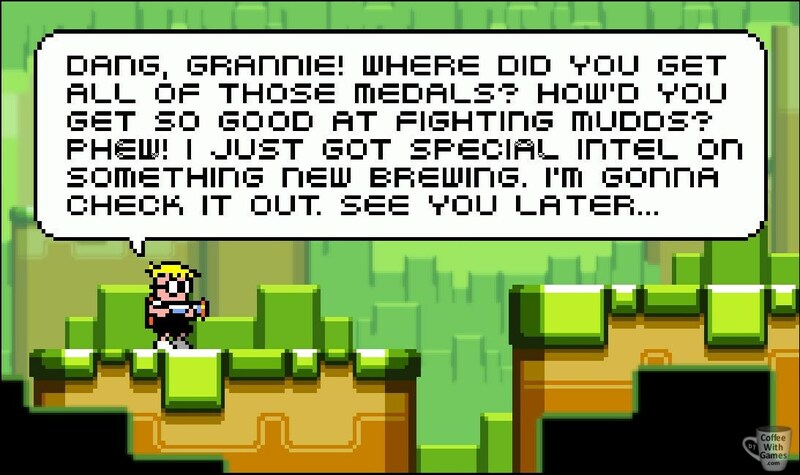 Mutant Mudds - I wrote last month that I had "completed the main levels of Mutant Mudds on December 31st." Well, on January 8th I tweeted, "@JoolsWatsham @mutantmudds Just finished a little something. "Brewing" reference for the win! #100% #WorthEveryPenny". I had completed every single level in Mutant Mudds. The V-LAND levels. The G-LAND levels. The CGA-LAND levels. All of them, finally! Even after completing them, I am still being voluntold by Bean 1 to play the game some. 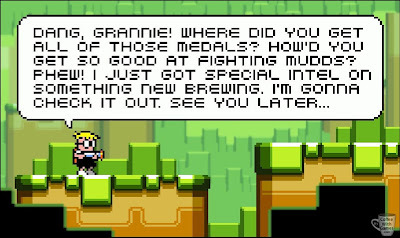 Until Mutant Mudds Deluxe releases for the Wii U later this year, and Mutant Mudds 2 sometime later (maybe for the Wii U? 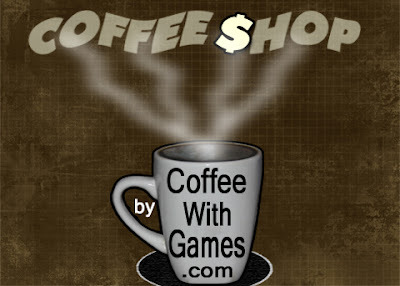 ), I'm sure I'll be playing levels randomly on the PC version, and maybe even some on the iOS version I grabbed for free last week on Mrs. Coffee's iPhone. "...something new brewing."? Coffee? Has to be coffee! NBA 2K13 Demo - I downloaded this demo from the Wii U's eShop, and played through 2 or 3 demo periods. I lost all of the demo matches I tried. This is not an arcade NBA Jam type basketball game, but I imagine that once you learn the ins/outs of the game-play elements and setting up passes and shots, that it could make for an interesting and realistic simulation of the sport. I have never really gotten into the NBA video games, other than NBA Jam in the 90s, so I can't see myself picking this up just yet, but I am glad to see Wii U owners with the option to pick it up. Nintendo Land - This wasn't played much in January, but I did play a bit of the Yoshi's Fruit Cart mini-game and made some decent progress in it; the farthest I had made it yet. I still want to finish the Battle Quest and the Metroid Blast mini-games, but I think this will be a slow-burner game over the next several months. Sonic and All-Stars Racing Transformed - I still haven't played this one much, but what I have played of it, I have enjoyed. 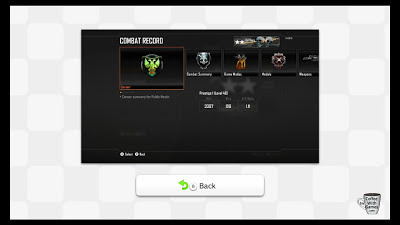 Early in January, Jeremy (from NintendoFuse.com) and I hopped online in the game to try out the online races. He beat me soundly in every race, but the game ran well. We even experimented with the Wii U Chat, but didn't have much fortune getting a solid connection (we found out it apparently requires a higher speed broadband connection, than just the lower end speeds that some ISPs offer). This is a game I'm hoping to get through this month, and possibly provide some video coverage of as well. Super Mario Bros. 3 - This is another Virtual Console game I played randomly with Bean 1, or with him watching. I really hope that Nintendo figures out the Wii U Virtual Console quickly, and gets as many of the older Mario titles up on it sooner, rather than later. We didn't beat Super Mario Bros. 3 in January, as our play sessions usually don't last very long, but we make decent progress when we play...until Bean 1 resets the save file and we usually have to start over from the beginning. I'm still amazed that this game was released on the NES, and I think it is just one of the many games helps with the "game-play over graphics" debate. Super Mario World - Another Virtual Console game, and another one Bean 1 would randomly select and I would end up being told I needed to play it. We beat a few levels at a time, like the other Virtual Console Mario games, and then usually move on to something else. The Legend of Zelda: A Link to the Past - This is another game that Bean 1 requests to play, or watch me play. He actually gets around the world pretty well, and can attack and kill enemies, and knows where the secret entrance to the dungeon is and how to get into it. We were making decent progress in the game, completing the first dungeon, but then Bean 1 figured out the magic disappearing file act, which he thought was absolutely hilarious. Basically he would delete every single file and say, "It makes it disappear!" This happens quite often, so we have started over from the beginning several times. I'm hoping his magic act will stop soon, and perhaps we can make good progress in the game, because I don't ever remember beating this one when I was younger! 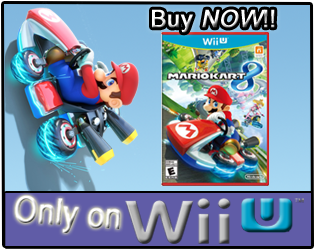 Mario Kart Wii - This is one Bean 1 requests to play occasionally, and it's one he enjoys and can now even complete races; sometimes finishing 1st! I actually enjoy the music in some of the levels, A LOT. Moo Moo Meadows is probably one of my favorite levels because of the music in it, at least right now. Bean 1's favorite level right now is probably Wario's Gold Mine, because is has "train tracks" throughout the level, which are really the tracks for the mine carts. 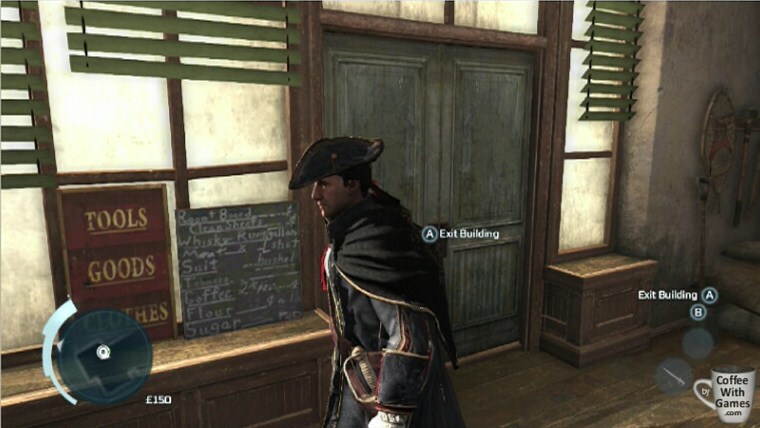 Every good assassin needs coffee? 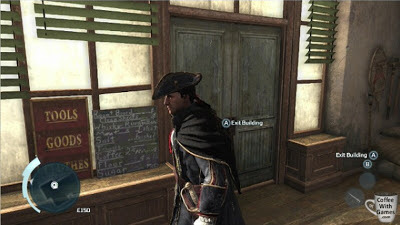 Assassin's Creed III - What happens when you join GameFly trying to get one game, and they don't have it? Well, they automatically send you the 2nd game in your queue. This is how Assassin's Creed III ended up in our Wii U collection, and is still around. I haven't played it much, just one night really, but I did enjoy what I played of it. There has even been a coffee reference already spotted in the game (seen in the image above), which of course makes this a GOTY contender already, because finishing games doesn't matter around here, just how many (or any) coffee references are in the game. Rabbids LAND - I started playing this in January, and so far have put a little over 5 hours into it. This is definitely a different Rabbids mini-game experience from the Wii titles, because of the board game setup. I haven't had the chance to play it with Mrs. Coffee yet, or Bean 1, so I don't know how the multiplayer adds to the craziness of it all, but I have enjoyed the ability to play it using just the GamePad with off-TV play. Rayman Legends Demo - I downloaded this demo when it become available on the Wii U eShop, and have enjoyed it sporadically, as has Bean 1. He has almost completed one of the levels in the demo, twice now. He is close, soooo close, like one jump away from beating it close; but usually gets hit by an enemy right before making the jump. ZombiU Demo - My neighbor has my copy of ZombiU right now, but I did download and completed the demo for the game. I was interested to see what Ubisoft used from the game for the demo, and I was a little surprised by their choice, but it definitely gives players a good overall feel for the game I think. If you are interested in ZombiU, but not sure about the game-play and style, the demo for the game will give you a good idea of what you can expect. World of Goo - I decided to try and get Bean 1 interested in another PC game, other than Mutant Mudds. I have had World of Goo on my Steam account for a while now, but never really played it. I fired it up the last day of the month, and showed Bean 1 what it was about. Every time I would beat a level and the container would fill up with goo and the Goo Balls at the end, he would say, "It's coffee! "; which the goo does have a dark coffee appearance, so I can't blame him there. We have completed 3-4 levels so far, and if I install it on our PC like Mutant Mudds (I have the file from a Humble Bundle I think), then I think Bean 1 will start playing it more. As for what my most played game in January was, that would be Black Ops 2 (or II) for the Wii U, as the image below shows! 1. and 2. were not games! As always, if any of you have a Wii U feel free to add my Nintendo Network ID, Coffees, to your friend list. If you have any questions, or thoughts, about the games that I played during January feel free to share them below in the comments section, or even email them to me if you prefer. Were there any coffees you consumed in January that were perhaps new for you, like the Café Bustelo Coffee Espresso blend was for me? Also, what games did you find yourself playing in January, and did any of them stick out to you particularly more than others?